During a recent visit with my mom, she pulled out a book of “Treasures” that she and my uncle had unearthed. 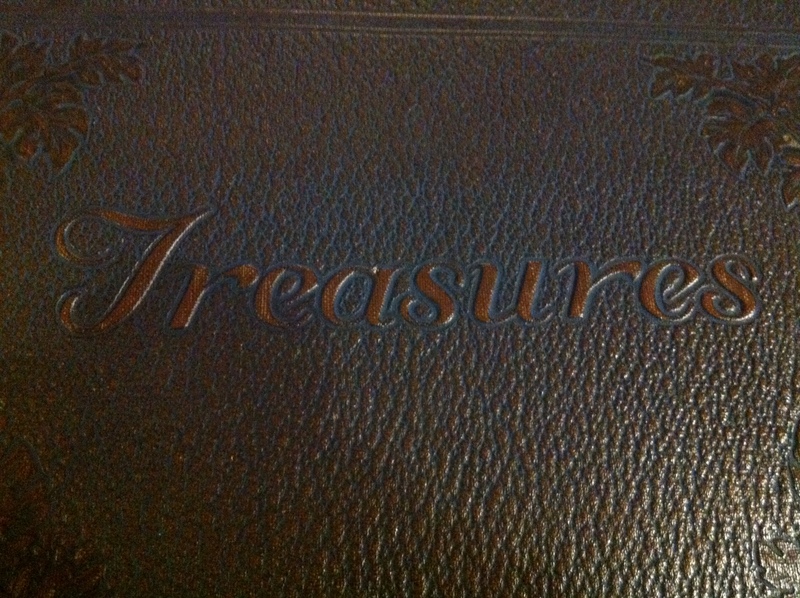 The album actually had “Treasures” emblazoned across the front in a font usually reserved for the words “Antique” or “Apothecary.” The album had not seen the light of day since before I was born. Inside were never-before-seen-by-me pictures of my grandparents as well as uncles, aunts, and cousins I had never met, though my mother refuses to believe it. Everyone was dressed to the nines for each photo, even though they were usually standing in a dusty field. Our current photo albums are littered with our raggedy little group in pajamas, tearing into Christmas presents or doing dishes after Thanksgiving dinner, always with messy hair and half-closed eyes. But there was my mother, with her perfectly round cherubic face and shiny ringlets, decked out in her Sunday best, walking around in that dusty field at nine months old. It was the Depression; kids didn’t enjoy the luxury of waiting until their first birthday to learn to walk. Jacob was born during the technology boom. He rolled around, chubby and euphoric from the optimistic atmosphere of a modern day gold rush, lazily waiting until he was nearly 15 months before taking his first official step. There were a few handwritten entries throughout the book, noteable things that had happened in the 1930’s and 40’s. “Your grandmother was very up-to-date on stars,” my dad said as I looked at him curiously, unaware of her interest in astronomy. He clarified, “she kept very close track of celebrity news.” Thank God, it’s hereditary. Who am I to fight my genetic predisposition to know exactly what Blake Lively’s or Ryan Goslings’s relationship status is at any given moment? 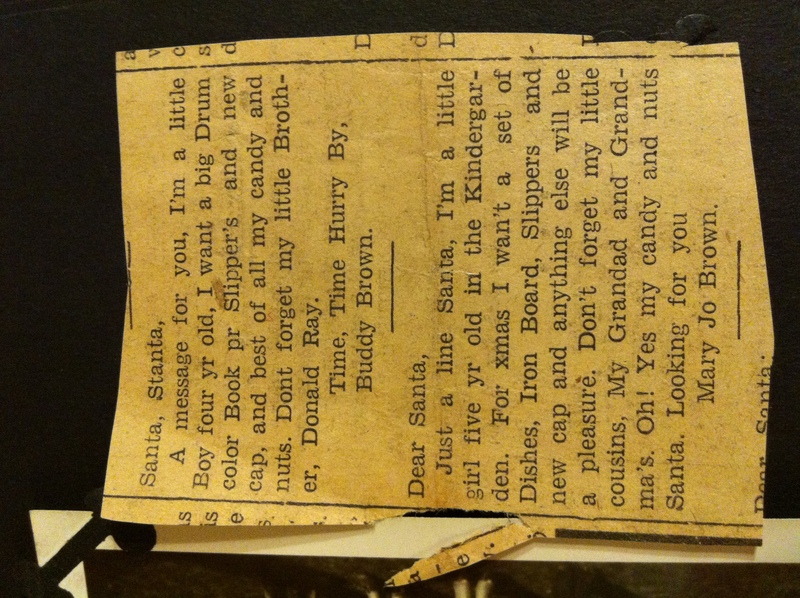 Toward the back of the book of Treasures, was a little newspaper clipping from Christmas, 1940, featuring unedited children’s notes to Santa. My uncle’s note was first. He asked for candy and nuts, a big drum, slippers and a coloring book, and added a special request to Santa to please not forget their little brother. Then there was my mom, the big sister – a 5-year-old who asked for dishes, an ironing board, slippers, candy and nuts. I couldn’t believe it. This was very nearly the same list she’d rattled off my entire life, save for the new ironing board; that was just once a decade. She still loves ironing, and will proudly tell you how she was the victor of her high school’s home economics ironing contest. She eyes me suspiciously every time I tell her I don’t know where our iron is, or worse, if we even still own an iron. I had waited in line to meet Santa who was holding court in our town’s toy store. The purse I was referring to had a little buckle and a long strap that made it the perfect cross-body bag for the 7-year-old on the go. It wasn’t bulky but had plenty of room for the necessities – Dr. Pepper flavored lip balm, gum, a hairbrush, three key chains with no keys, and no fewer than 11 pens. A red purse has popped up on my list every few years since. Meanwhile, two states away, my future husband Johnny and his little brother Mikey were propped up on the knee of their small-town Idaho Santa who greeted his guests at the auto parts store. That Santa may or may not have been failing Algebra while depending on the healing powers of Stridex to assist with his…youthful complexion. He also weighed about 120 pounds and hated his job. John doesn’t remember what he asked for. He probably said “It’s ok, Santa. I really don’t want or need anything,” while wholeheartedly meaning it, frustrating the chestnuts out of Santa and solidifying his reputation as being nearly impossible to shop for. Not that I have any experience with, or am in any way also frustrated by that. Our own boys have grown and changed over the past year. Zach’s desire to see Santa was not as urgent and his normally adorable wishlist of toys was replaced this year with a football video game. Jake has braces now and his feet are bigger than mine. He surprised us all by putting some special, and crazy-hard-to-find basketball socks at the top of his list…SOCKS. (Nike Elites; heard of them? I hadn’t either. Some joker’s selling a $12 pair online for $52.) The rest of their lists don’t stray too far from there – if a Manning brother, a big league pitcher, or anyone on the Miami Heat endorses it, wears it, or plays with it, it’s likely on the list. It’s not the stuff that overwhelms me; it’s what the stuff represents now. The boys are big, and they are getting bigger, just like I’m sure my Dad was less than thrilled that my one wish was a red purse so I could look like a Charlie’s Angel or Laura from “Remington Steele.” While we know the presents and the busyness aren’t the parts of Christmas that fortify us, they can perhaps stir up a memory or two, and cause us to pause and think and feel things – whether they are happy or sad or funny or wistful things. But that’s not where we find our true joy, or peace, or promise of a new and brighter day. My prayer for you this Christmas is that in spite of all your stuff, your to-do lists, the baking you meant to do, and the half finished Christmas cards, that you find your Treasure, whatever that may be for you right now – peace, joy, or hope – and you pass it on. 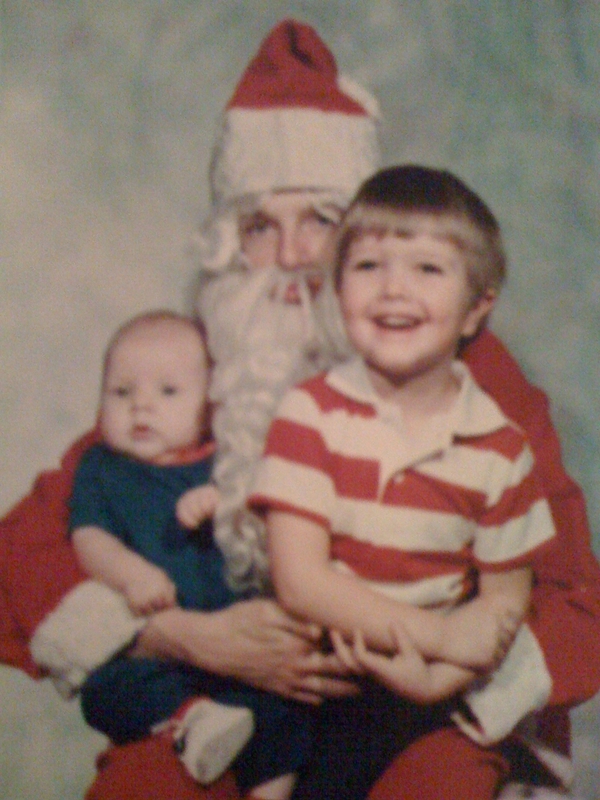 Merry Christmas, Happy Holidays, and a Joyous 2012 to you and yours! Colleen – you are a brilliant writer. Your command of the language gives you the ability to bring one into your life and enjoy it with you. Thank you for sharing your gift! Wow, Barbara – thank you. That is so touching, and such a compliment, I don’t even know what to say. Thanks so much for reading and for taking the time to leave me such a kind note. Merry Christmas! I have the same reaction to your posts that I have when I watch Modern Family…..I’m chuckling and nodding my head in agreement….And before I know it, I feel a lump in my throat and tears in my eyes. Your writing really grabs my heart. It’s a pleasure to read your words. LISA – wow – thank you! You don’t know how much that means to me! I was choked up by the end of your note! I really appreciate you reading and taking the time to leave me a message. wow, double wow. Thank you! and Merry Christmas! Wow! Another great one. I agree with Lisa; I shake my head in agreement, laugh, and then ultimately get a little choked up. Beautiful, meaningful column. Thank you and Merry Christmas. Thank you Diana, so so much! That means a lot to me and I appreciate your reading it (and throughout this year! ), and your kind words! Wishing you and your family a very Merry Christmas! As always, I love reading your reflections. You always hit the right note with the sentiment. I can’t wait until I come back to CA to visit so we can catch up in person. Thanks so much Erica – I really appreciate your reading, and your nice note. I can’t wait until you get back to Cali too for a visit. Warning, I would likely expect a sample of something you have baked – I have been salivating from afar for too long! Merry Christmas to you and your guys….cheers! As always, you write with such gracefulness and joy. I smile with every post! Thanks for the perfect perspective and reminders of past times. Merry Christmas (and I hope you get a red purse!). Jody! How nice to hear from you! Thanks so much for reading and for your kind note – I appreciate it so so much! I know you are such a busy lady – wishing you and your lovely family a very Merry Christmas and blessed 2012! Thanks again for taking the time to drop me a message 🙂 Cheers! Love the article, Colleen! 🙂 It definitely reminds you of the reason for the season.